This book describes the strategies used by President Putin from 2000 onwards to recreate 'Greater Russia', that is a Russia that controls most of the territory of the former Soviet Union. It shows the subtlety of the means of control, often through creating economic dependencies in the 'near abroad', including exploiting energy dependency, through prolonging other political and military dependencies, and sometimes through traditional 'power politics'. 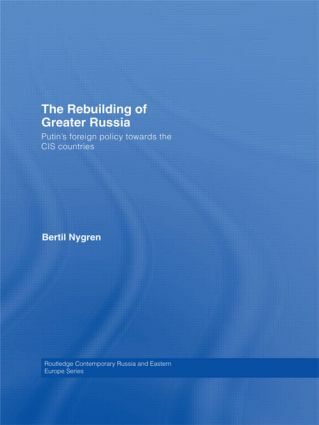 Bertil Nygren argues that after seven years in power the results of this strategy are beginning to show, providing comprehensive coverage of Russia’s relations to the former Soviet territories of the CIS countries, including Ukraine and Putin's role in the events surrounding the 'Orange Revolution', Belarus and the attempts to form a union, the Caucasus and Russia's role in the various conflicts, Moldova, including the Transdniester conflict, and Central Asia. This is an important subject for Russian studies experts and international relations scholars in general.